We’ve owned it for almost 26 years. There were times when we first bought it that we worried that perhaps it was a white elephant or a “boat anchor” to use Elv’s terminology. It came with a lot of not so obvious problems. Not to two green farm-raised young people who had zero experience, at least. I suppose if someone had pointed out the issues the first time we looked at it, we might have been deaf to it. I loved it from the first time I laid eyes on it. The problems that were pointed out to me could have been true for anything of this vintage. In other words, we were financially fit for a fixer-upper and to my mind it might as well be unique. We had all the time in the world and we weren’t uppity folks. Most of all it was our own. Our own privilege and problem to do as we wished with a piece of property. What more could one, ignorant couple ask? As it turned out, we asked for a couple of changes effective immediately. We took out a the wall between the front porch “bedroom” and the interior room creating what has been our living room ever since. You’ve seen a few pictures already of this room. Someone had refinished the interior throughout with a tan tile for the floors and pale tan paneling for the walls, upstairs and main floor. It drove me crazy. You couldn’t get away from the flat boredom of the interior. This led to the discovery that you can paint and wallpaper paneling. Oh yes, you can, and we did! Before too long we had to replace the joist, the floors, the roof, the well, and the sewer. It was amazing! It is good we didn’t know what we were in for when we purchased. Thank God for a carpenter who believes that the customer is always right even if he’s really wrong and that anything you want is possible even if it isn’t kosher. We cut corners to fit our budget and splurged at other places to fit our dearest wish, like half log siding on the top story to go with the stone. This old house isn’t done even today. It needs a few more new windows, a proper kitchen, and a bedroom addition on the main level. It isn’t happening anytime soon…certainly not in our tenure here. When we sell, the realtor is going to tear his hair out trying to convince us what all we should do to get a better price. That’s okay. We’ll get whatever dollar value God wants us to have at that point and the buyer can have all the personality that goes with this old house. It’s been unofficially for sale for a long time and doesn’t sell. That only makes this whole venture even more exciting to me. It’s God’s and for now He is letting us call it home. To us it is home. To the local native children it is a haunted house. That little piece of folk lore has only served to keep things a little less prone to walk off when we’re gone, we think. When the Native American children come in they always ask if there is an upstairs. Always! Sometime, I hope someone can tell me why they ask. They don’t want to see it, really, they just want to know. Who built it? Not sure, but the stone work was put up around a frame house in the forties. It’s the same style stone work as is Al Capone’s lodge that is near here. What a wacky distinction. We took a walk yesterday. Two year olds can walk miles without any carrying. You can’t be in a hurry. And you must be interested in bugs, leaves, sticks, and playing in the road. I recommend it to anyone on a Sunday afternoon. For our three stoves. We enjoy firewood work. 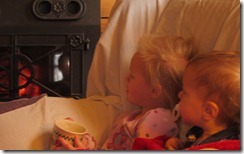 We heat our house with wood burning stoves. All over our yard this time of year. Just so you know, oak leaves have to be raked up and removed. No they do not make good mulch because they don’t rot in a month of Sundays. They have to be coaxed and cajoled into heaps in the woods at the edge of our property. We haul huge tarp loads of leaves over to the woods every fall and again in the spring sometimes and dump them on last year’s heaps. For those of you still having the notion that you can usher them into usable mulch, be my guest and come fetch them anytime you wish. If I know you’re coming I can just leave them there on the lawn for a few more days and you can have them fresh off the trees. Offer is current and good for one more week. Back and front and just through the woods the roads hem us in. We don’t try to keep pets anymore. We have had too many dogs and cats just disappear or get hit on our roads. We value privacy because we have so little of it due to these roads. It’s like living in a fish bowl. But they also provide us endless biking and hiking to the lake and back. Big redeeming factor. In summary, life is good. We have made a lifetime of memories here. And there are more to come. I like the post, and the header pictures…they give me such a warm feeling inside….I love autumn!